For a quality parts and service department in Chambly or Saint-Jean-sur-Richelieu, come to Coupal & Brassard today! Here, you're in good hands. Nissan owners in the Chambly and Saint-Jean-sur-Richelieu area who are looking for a high-quality maintenance service can trust Coupal & Brassard. We offer you modern Nissan vehicle maintenance facilities, and our experienced technicians know how to preserve the quality, efficiency, and performance of your Nissan vehicle. From simple oil changes to more complex repairs and preventive maintenance, we have everything you need at Coupal & Brassard Nissan to ensure the reliability and safety of your Nissan. While you're waiting for your vehicle, rest in our modern waiting room, or take advantage of our shuttle service that will take you wherever you need to go hassle-free. We also have plenty of special offers on all our new Nissan vehicles, which makes servicing your Nissan vehicle more affordable than you think at Coupal & Brassard dealers in Chambly and Saint-Jean-sur-Richelieu. To find out more about our mechanical maintenance services offered at Coupal & Brassard, or to book an appointment, Contact us today in Chambly by calling (450) 658-3443, or at (450) 347-5593 for our St-Jean-sur-Richelieu location. or submit our online contact form! Shopping for tires isn’t always easy. First of all, new winter or summer tires are expensive, and secondly, it is not always easy to know if you have made the right choice for your new tires. At Coupal & Brassard Nissan dealers in Chambly and Saint-Jean-sur-Richelieu, our mission is to help you find the perfect new tires for your Nissan vehicle while respecting your budget. At Coupal & Brassard, we have a complete inventory of new winter and summer tires at competitive prices. Our tire inventory includes several models from the most recognized brands and our team of experts will be able to help you find the summer and winter tires that will best suit your Nissan vehicle and your lifestyle. We can install your summer or winter tires on site, make sure they are well balanced, and store them when not in use. You can even order them online. 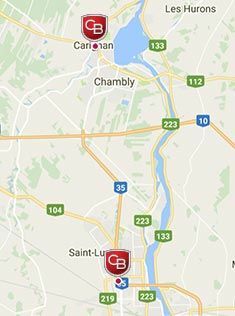 At Coupal & Brassard in Chambly and Saint-Jean-sur-Richelieu, we are always looking to go further to ensure your satisfaction. Come and meet us today and discover our special offers on our large selection of summer and winter tires for your Nissan vehicle! For a wide selection of Nissan parts and accessories in Chambly and Saint-Jean-sur-Richelieu, Coupal & Brassard is your number one destination. We have a great selection of Nissan parts and accessories that have been specially designed for your vehicle to maintain its safety and reliability while improving its performance, style and versatility. At Coupal & Brassard Nissan in Chambly and Saint-Jean-sur-Richelieu, we have the Nissan parts and accessories you are looking for. 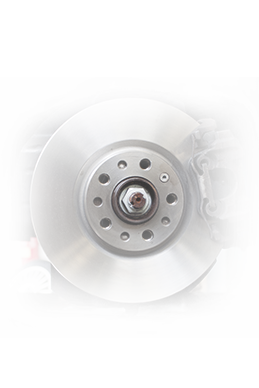 We have a large selection of original parts that we use in all of our repairs, and we can also help you find the perfect accessory for your summer vacation, or to improve the design of your Nissan. Come to Coupal & Brassard Nissan in Chambly and Saint-Jean-sur-Richelieu today. You'll find a wide range of accessories such as our trailer couplings, summer wheels, winter wheels, roof boxes, roof rails, bicycle racks and much more. We can install your part or accessory on site to make your life easier, and you can even order parts online. To learn more about our Nissan parts and accessories, contact us today at Coupal & Brassard Nissan! In the event of an accident, contact us at (514) 434-5593. We offer a towing service available 24 hours a day, 7 days a week. 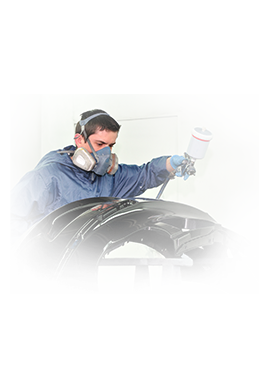 Restore your vehicle’s appearance with Coupal & Brassard’s body shop specialists. Our workshop meets the high standards of the Nissan manufacturer and uses only certified technologies to take care of your car. Our dealership is a member of CarrXpert and is affiliated with the Corporation of Car Dealers of Quebec. 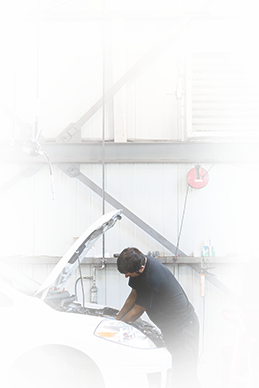 Whether your vehicle requires work as light as repairing a cosmetic scratch or something more extensive such as a damaged body repair, our technicians are here to restore your vehicle to mint condition. We offer you a fair estimate on repairs and are committed to a strict code of ethics. 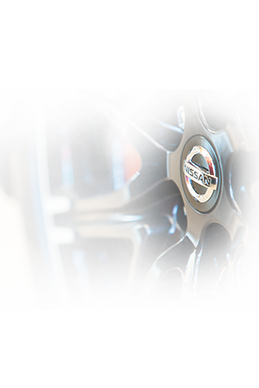 We use genuine Nissan parts and accessories to preserve the qualities of your vehicle. Whether you’re involved in an accident, collision, or even if your vehicle falls victim to vandalism, we can help you to quickly resolve the problem. Book a service appointment or contact us for more urgent situations. We offer a towing service available 24 hours a day, 7 days a week. Find out more about our mechanical services. When making a claim on your insurance, you have the right to insist that any repairs be made to Nissan standards by a factory certified shop. You have the responsibility to maintain the top value of your vehicle. It is to your advantage to maintain the aesthetics and minimize any wear of your vehicle to maintain its resale value. Find out about Coupal & Brassard services for your car, SUV or truck. 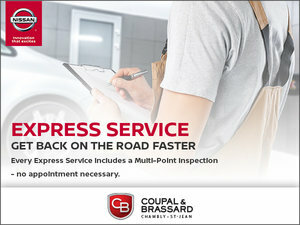 Your Coupal & Brassard dealership offers you a special EXPRESS SERVICE with no appointment required. We understand that your time is precious, so take advantage of our Express Services in less than 30 minutes. 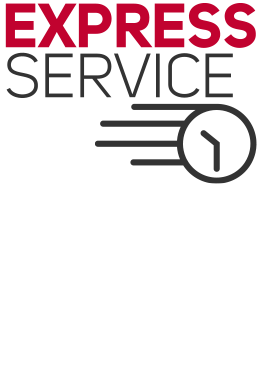 Your Express Service will be completed in less than 30 minutes or less from the moment your vehicle enters the service area. Get an oil change and filter and a 21 points inspection for free! Each Nissan Express Service includes a free multi-point inspection. Our trained Nissan technicians will inform you of the status of your vehicle and offer you advantageous solutions to keep your car, SUV or truck running smoothly. Coupal & Brassard’s Express Service packages are guaranteed to give you peace of mind. Inquire about our after-sales service and do not hesitate to contact us with any questions.